If there was ever a locale in need of shot of fresh, innovative design, it’s the streets and lanes surrounding London’s St Paul’s Cathedral. In amongst the plethora of nameless, faceless chains that saturate the historic-slash-business area now sits Shot, a café dedicated to clean, nutritious food, founded by nightlife entrepreneur Asad Naqvi in collaboration with Rahil Malik, and with the help of nutritionist, Alice Mackintosh. Designed by London-based architecture studio Wilson Holloway, Shot’s interiors are a direct reflection of the scientific approach to the development of the food and drink served here. This is most obviously noticeable in the white curved ceramics, which bestow the space with an aesthetic reminiscent to that of a laboratory. The tiles, manufactured by Dutch specialist D-Tile, have allowed the designers to fully integrate key features such as the customer fridge, service counter and menu screen into one continuous expanse. 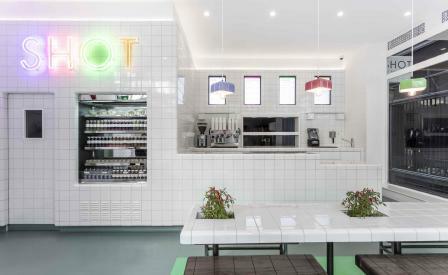 They also emerge in unexpected locations such as on stools and pendant lighting, where custom hues were blended to match SHOT’s branding; colours also applied to the rubber flooring, neon signage and planting, which together offer a neat counterbalance to the clinical design. Alongside a seasonal menu of dishes that are cooked on site daily is an extensive range of cold press juices, health shots, and smoothies that promise everything from beauty to endurance. Adhering to a set of ten commandments which range from ‘clean cooking’ to ‘clean proteins’, Shot guarantees the ultimate power hour, where city slickers can enjoy pure food in an equally spotless space.